What do you do when you’re up at 1 o’clock in the morning craving something chocolate, something warm and something that doesn’t take much work? 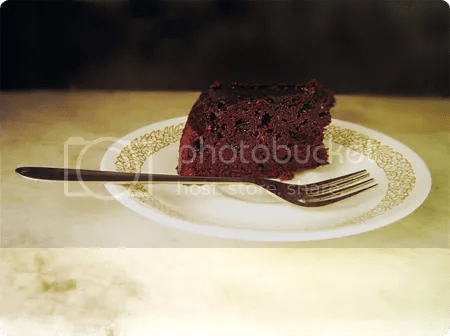 You thank Chef Wan for the Chocolate Valentino flourless cake. – Take the molten chocolate off the heat and let si for a minute. – Fold in the whites into this chocolate-yolk mixture in 3 parts. Fold. This is important, becaue you don’t want the whites to deflate. The cake will turn out flat if they do. – Bake for 20-25 minutes at 350-375 degrees. 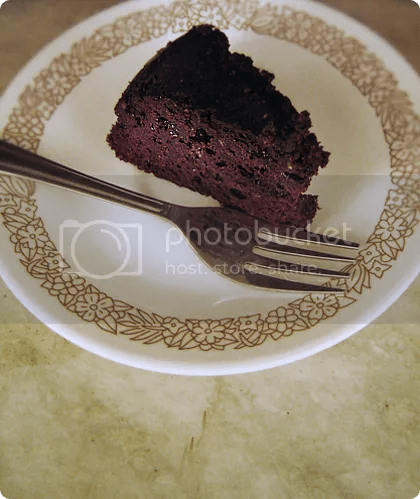 The cake ideally should look like a brownie, on the surface. – Cool on the rack. And then thank Chef Wan again. 1)Its very difficult to whip egg whites to peaks with one hand while you’re holding your cellphone on the other, talking to a certain someone. Earphones, at this point, come in handy. 2) The cake tastes better the next day. 3) Too many eggs and the cake turns brownie-like on cooling. Refrigerating overnight, makes it slightly crunchy. I had to leave it out for sometime to bring it back to cake-like consistency. 4) Tastes a whole lot better along with vanilla or banana-strawberry ice-cream. The next morning, I just had enought time to make some chocolate ganache to ice the cake with. Very simple. Chop chocolate. Boil cream. Add it to the chocolate, Stir from the centre outwards to melt the chocolate. Adding artificial flavors or alcohol is optional. Spread evenly on the surface of the cake. Thanks for dropping by! Nice blog you have here incidentally and great to see that you know Chef Wan – Malaysia’a food ambassador! !